SEOUL - More than 800 North Koreans are dead or missing after major rain storms and flooding that damaged homes and farmland, a pro-North newspaper published in Japan reported from Pyongyang on Monday. Three major storms drenched North Korea in July, washing away crops and raising the possibility of famine in a reclusive country that already battles chronic food shortages. The Choson Sinbo said that as of July 17 that 549 people were killed, 295 went missing and 3,043 were injured in the storms. The International Federation of Red Cross and Red Crescent Societies said last Friday that flooding in the second week of July had killed 151 people and left 29 missing. "Heavy rains fell in parts of (North Korea) between July 14 and 16 and caused major damage," Choson Sinbo said in a report posted on its Web site (www.korea-np.co.jp). The floods affected 28,747 families, 7,500 of which saw their homes destroyed, it said. Nearly 24,000 hectares of farmland were damaged either by flooding or being washed away, the report said. 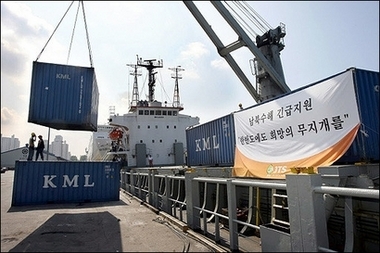 The area is equivalent to about 1.3 percent of the North's arable land, according to data published by the South Korean government. North Korea has said in its official media that the storms left hundreds dead or missing. North Korea has turned down aid offers from South Korea's Red Cross to help it cope with flooding, but a North Korean official was quoted as saying last week the country would not refuse help if it came with no strings attached. The U.N. World Food Programme has said the North had declined its offer of help, saying it would deal with the problem on its own. South Korea told the North in talks just preceding the storms that it would withhold food aid until Pyongyang returned to stalled talks on ending its nuclear weapons programme. Private groups in the South have been urging the government to restart humanitarian assistance and said they were preparing an aid package for the North.